Teaching is nothing less than an art. A classroom is often made up of a mixture of students who posses different levels of acumen and intelligence. Hence their respective grasping power also varies. Herein teachers often require special tools that will aid the students to understand and grasp the subject better. 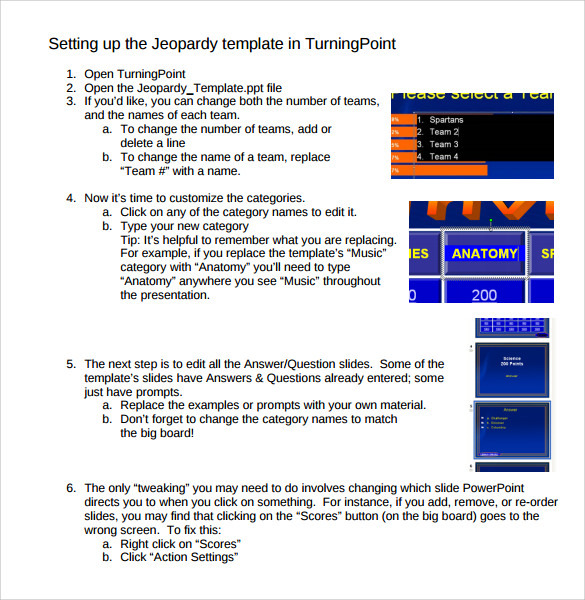 Teachers can access these classroom jeopardy templates, which comes in the form of PowerPoint. These templates are easily editable and can be changed as per requirement. You may also check Classroom Newsletter Templates. 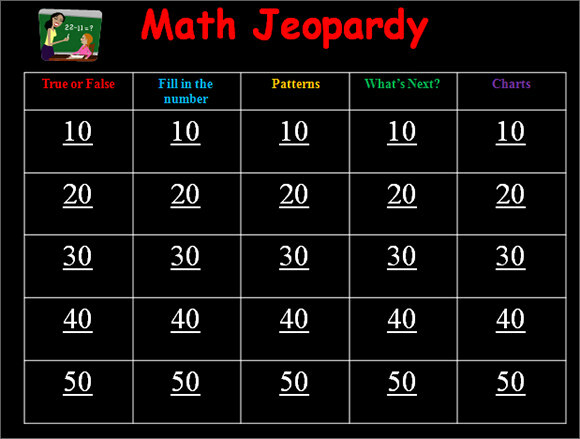 This template is perfect for the creation of a Math Jeopardy sample. The design of the template is very attractive and is strewn with attractive and bright colors. These colors help to make the template look all the more striking. The template is hundred percent responsive and can be edited with ease. Science is a subject that comes with a huge amount of details. Students often require an additional help that will support them in remembering the various details of the subject. 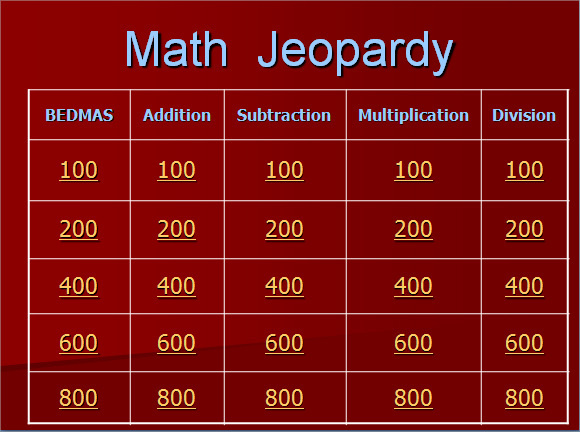 The teachers of this subject can easily download classroom jeopardy template that will help them to remember the subject better. The look of the template is very simple and attractive that can hold the attention of the students. Simple and attractive are the best ways that this template can be defined and described. The template can be used by teachers of different subjects and of different levels. The template comes in the form of a PowerPoint and can be edited with simple steps. The template has a great resolution range that provides brilliant printout quality. 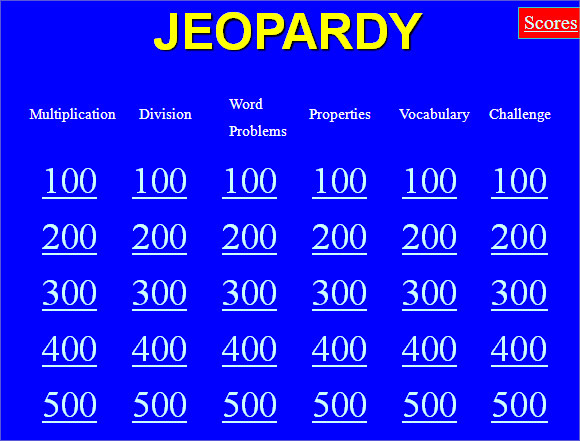 This is a classroom jeopardy template that is perfect for the subject of mathematics. The background theme is provided with a simple solid color. This makes the things written on the template very clear and bight. The template design has a grid pattern on it that gives the template a very neat and organized look. 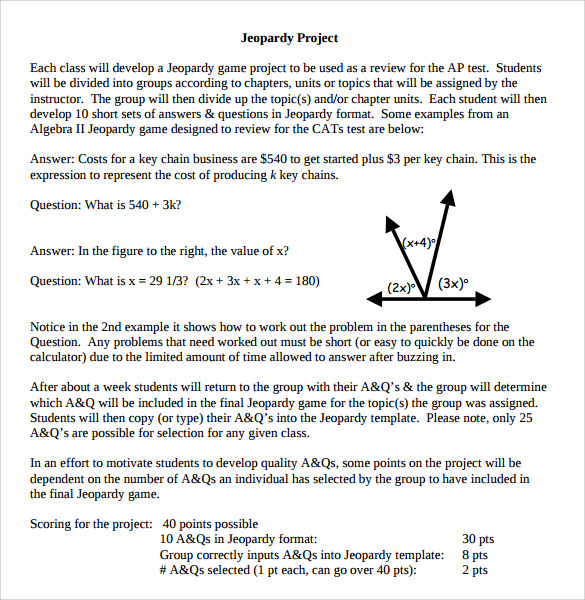 bsolutely perfect for the creation of a jeopardy card, this design layout can be used for any subject and for any class. Teachers can download this template with a lot of ease and can easily print this template/. The resolution range of the template allows very high quality printouts. The background theme can also be changed as per the requirement of the user. 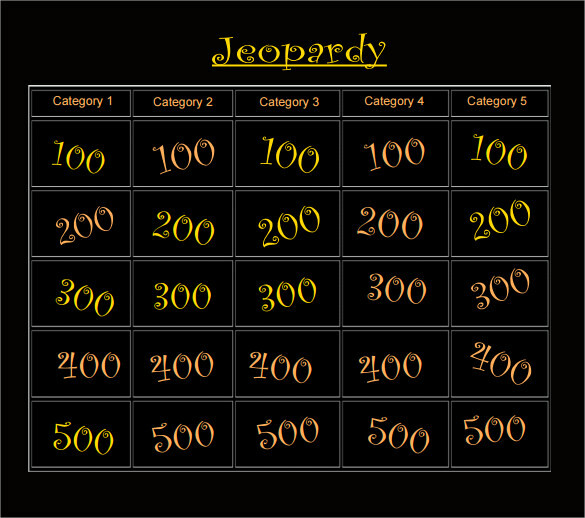 Teachers, who are looking for a template to create their jeopardy cards, will find a perfect solution with the classroom jeopardy template. The design of this template is 100% responsive and can be edited wherever required. This template design has embedded instructions within itself that will help the teacher to create effective tools for student learning. Neat and clean this template has a very attractive look. The final feel of the template design is very organized. This is ensured by the well spaced out grid pattern on the template. The dark background of the template ensures that the subject written in light color can be seen very clearly. The template is very easily navigable. This jeopardy template has a format that is written in the format of a literary paragraph. The literature can be changed as per the requirement of the user. The template is also supported with matching illustrations. The template has been provided with responsive features and is fully editable. 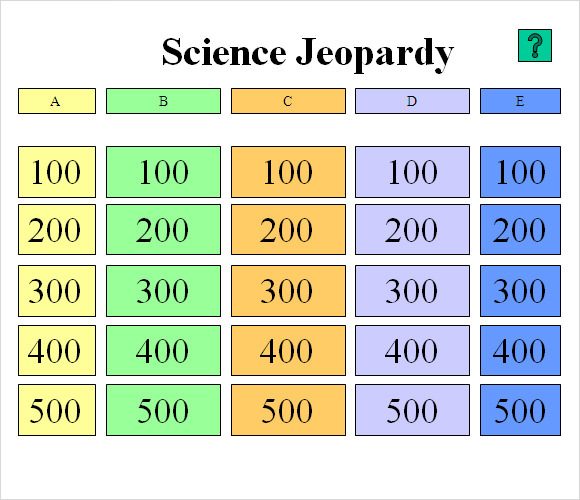 Jeopardy templates are of immense importance for the building of the learning and memorizing capabilities of the students. 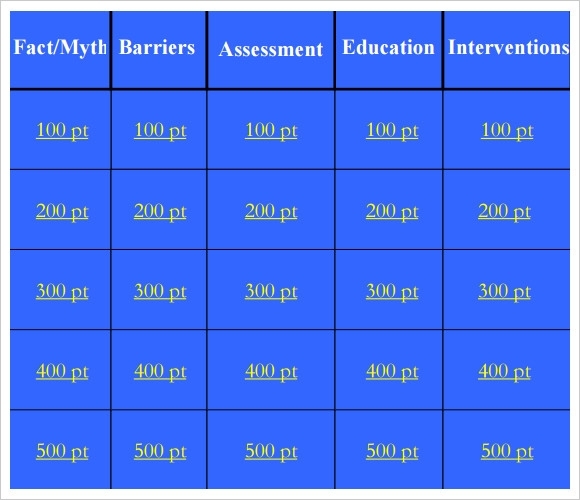 Teachers can rely on the classroom jeopardy template for the creation of effective jeopardy patterns.